So one of my roommates plays OSRS near exclusively since it's release, while I pretty much only hop on when I'm in the mood for a more nostalgic Runescape experience. The levels go so quickly at low levels and it's cool to feel like a noob again. 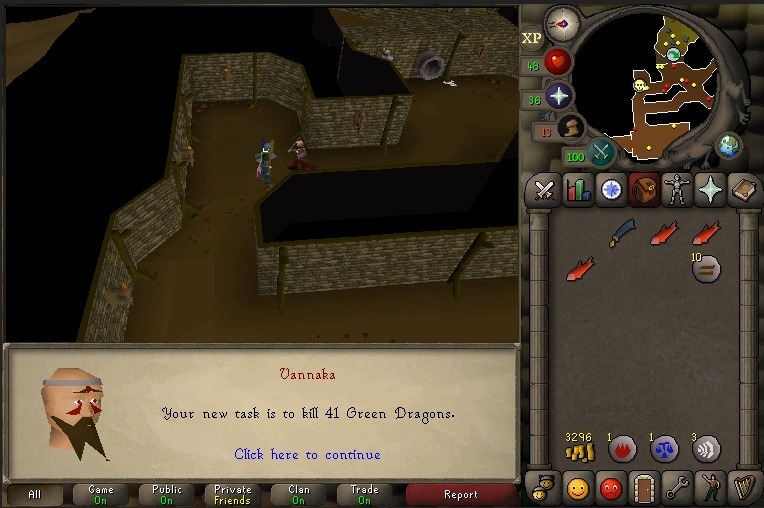 With Runescape Mobile releasing to OSRS first I've decided to pick up OSRS a little more just to prep for mobile release. Naturally my roommate noticed me playing and decided to ask questions about what I've been up to in game, which recently has been Lava Dragons. I also just did the Wilderness Easy Diary today. He looked at my stats and commented on how my herblore seemed out of place among my other stats, questioning how I could have afforded it. My response was, it was profitable, and how I had started building my cash stack in OSRS. From finishing Druidic Ritual you can easily start making money cleaning herbs and making (unf) potions, prices will vary over time but turning 15gp into 58gp plus a little herblore exp isn't too bad a deal to me. Link to wiki herblore money making Cleaning Lantadyme. Unlocked Fairy Rings. Finally, I don't need to walk EVERYWHERE. So, naturally I decided it's about time I get the Dragon Slayer quest done. Did Holy Grail beforehand hoping to get my Prayer up for protect from melee, didn't reach that yet but I think the defence levels helped. And now my chestplate matches the rest of my armor again. Now back to my regularly scheduled slayer. Level 43 Prayer; with protect melee unlocked, true Easy-scape is enabled. RS3: 44.3m EXP till max, goal was 48m exp left, ahead of schedule by 3.7m. -Having some fun with the nostalgia. 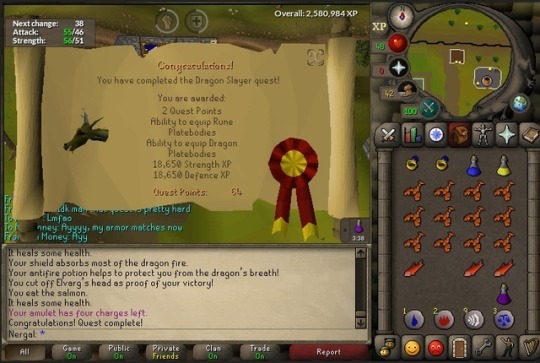 Finished the Client of Kourend quest, giving me double favor gain at all of the houses. REALLY wish this quest came out BEFORE I finished getting favor in 2 houses and was halfway through a third. Finished getting favor with Shayzien. Hosidius & Shayzien & Arceuus. Finished Fremennik Trials, picked up an archer's helm. 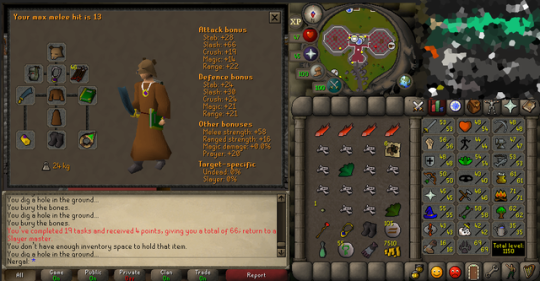 On the Old School grind. 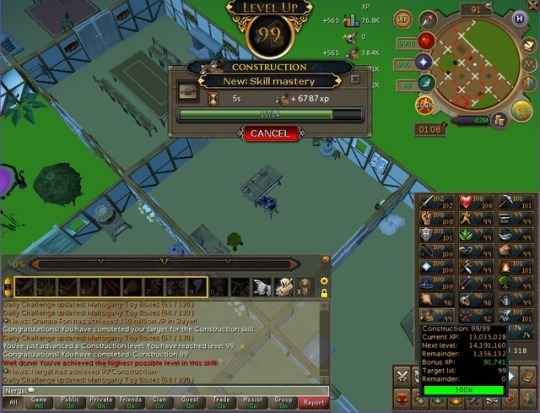 Up to total level 1132. Just finished Horror From the Deep and picked up the pages for a Book of Balance; the Zammy pages for making the Unholy Book are a bit above my price point at the moment and the Holy Book is just a shield, so given how cheap the Guthix pages are a figured good enough for now. Briefly considered the Arma and Zaros books but they are also a bit above the price range and far more niche, the bandos book is on the cheaper side but again very niche. Sunk over 90 million into a DXP stock which appears to be failing for some reason, it's generally pretty consistent so I'm feeling pretty demotivated by that. I can still use the material I just don't need the supply for myself. Could be worse though I suppose, only 273k exp till 99 Construction and then my last 'buyable' is Invention which can honestly be as cheap or expensive as I want it to be. Been passively rebuilding my bank, and who knows, maybe my stock will climb again. I've been training Ranged for free with a dorgeshuun crossbow and bone bolts, aiming for 50+ ranged before doing Monkey Madness. Got my first piece of Void Knight Armor, the top; still going to need gloves, robe, and a helmet, but it's nice to see progress. So I'm playing OSRS and I get a slayer task for trolls, they have crazy high ranged and magic defence and my defence is only 48 and they still hit pretty high in rune armor; so I figured I have the prayer level for protect melee that's the way I'm gonna go I think. In OSRS prayer still give 100% immunity to NPC damage (few exceptions, trolls aren't one), HOWEVER prayer potions cost a TON in OSRS. A 4 dose prayer pot in OSRS costs ~9,208gp right now. A 4 dose prayer pot in RS3 costs ~3,953gp right now. RS3 prayer is only like half-effective, but we have soul split and reflects so w/ever. Now based on the conversion of the cost of an Old School Bond (2.84m) to an RS3 Bond (17.41m), is a 6.130282m RS3 to 1m OSRS. This mean an OSRS 4dose prayer potion would cost 56,447.636656, rounded up to 56,448gp, in RS3. Now, again, protection prayers are 100% effective in OS rather than 50% and while taking no damage at a boss is probably valued at more than double taking 50% damage at the same boss, I cannot adequately calculate what the realistic value should be at my levels, I do know that buying prayer potions costing over 14 times what they cost in RS3 is not an economically efficient way to train. At the same time, getting to the mountain trolls is a pain because I am too low of a magic level for Trollheim Teleport and it's a reasonable walk up and down death plateau, so I had to figure out the best way to increase my prayer bonus to reduce my prayer drain as much as possible to reduce the number of times I had to hike up the mountain. Now I probably could/should have worn the Ardy Cloak, but the Accumulator didn't provide any negative stats and Trolls are a pretty terrible task at my levels so I kinda wanted the RNG of random steel items to low alch with my explorers ring. I also thought, and realized after the task that I was wrong, in thinking the bear head provided some offensive strength bonus, it just happens to get used by strength pures because it can be worn at 1Def and has stats comparable to I believe Black armor with some magic resist as well (no negatives); but I could have just worn a rune full helm, although I'm theoretically never taking damage if I prayer flick properly so just an aesthetic Bear Head I suppose. Anyway, overall I'd say the outfit worked reasonably well, only had to bank an hit the altar a few times, kept some emergency food with me but didn't really need it, and didn't have to pay for super overpriced potions. I still need to train my prayer up more though, especially since prayer potions do scale with level (every 4 levels is an extra point restored per dose); regardless, feels good to know I waste a hell of a lot less gp than some of my peers at school, I also used part of my Slayer profit to pick up a Peaceful Blessing for under 10k which is a +1 prayer bonus in the ammo slot which will be nice for melee/magic (even ranged if I get a crystal bow). Broad Bolts and Slayer Staff equip-able. 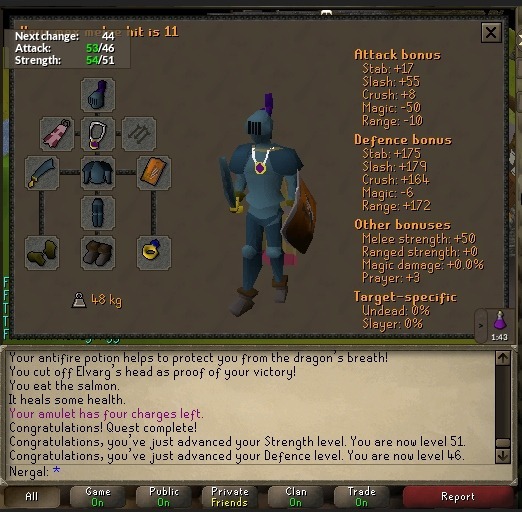 Swapped out my Dorgeshun CBow and Bone Bolts for a Rune CBow and Broad Bolts, max range hit immediately went from 13 to 19 (highest I've seen so far).